The subject of Traceability is slowly gaining momentum within the jewellery industry. Discerning consumers appreciate the importance of knowing exactly where the raw materials for their purchases come from. There are many more discerning buyers each year who seek out jewellery which has been sourced ethically—jewellery with a positive impact on the people mining the materials and on the surrounding environment. Provenance refers to the origin of a diamond. The word Provenance comes from the French word provenir which means “to come from” and relates to the origin and journey of a rough diamond from the mine, through the cutting process to the polished diamond that is presented to the consumer. In short, there is a growing demand information on the origin of the raw materials and their journey from the mine to the finished item. Diamonds and precious metals have come under intense scrutiny over the years— media attention has created public awareness of ‘Blood’ Diamonds (see Conflict Diamonds) and ‘Dirty’ Gold. Incredible progress has been made for creating channels of traceability with the introduction of Fairtrade Gold and Fairmined Gold—giving a fully audited system of gold from the mine to the finished jewellery. Both systems have a positive impact, empowering small mining communities—improving dangerous working conditions, reducing the harmful effect of chemicals on the environment and ensuring a fair payment for the gold produced. These are just some of the key benefits of gold produced under the Fairtrade and Fairmined systems. A small proportion of the World’s diamonds can be traced back to the original mine where they were extracted from the ground in the form of rough diamonds. 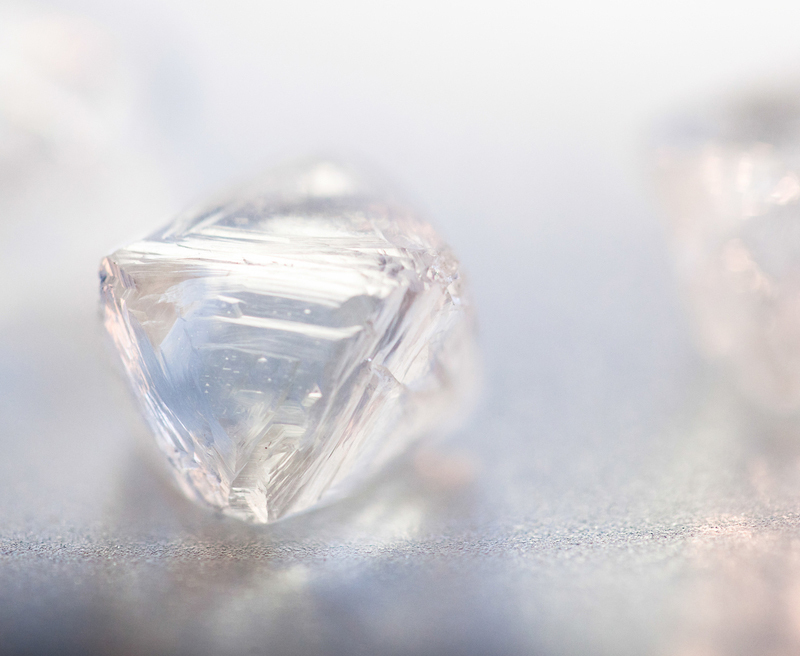 Systems that give diamonds specific provenance are the result of work by large diamond mining companies such as Dominion Diamond Corporation’s CanadaMark brand and the DeBeers Forevermark brand—both systems offer full traceability for diamonds. Each system has in place an audited trail from the rough diamond. 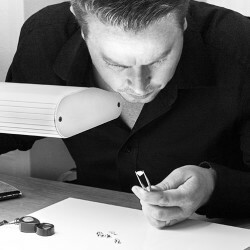 Both CanadaMark and Forevermark Diamonds are given unique traceable identification numbers that appear microscopically on the diamond. 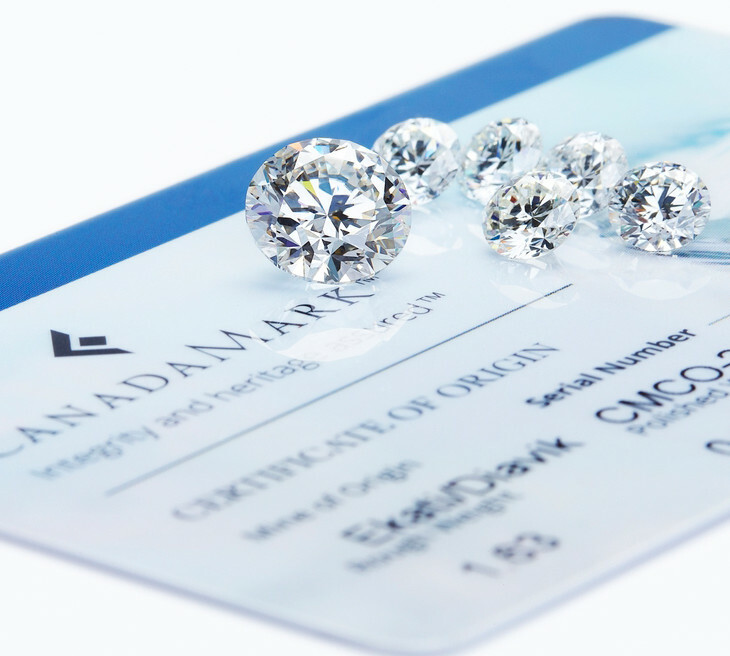 The CanadaMark diamonds we supply, include a laser inscribed CanadaMark serial number which verifies the mine of origin, rough diamond weight from which it was cut and the final polished carat weight of the diamond. 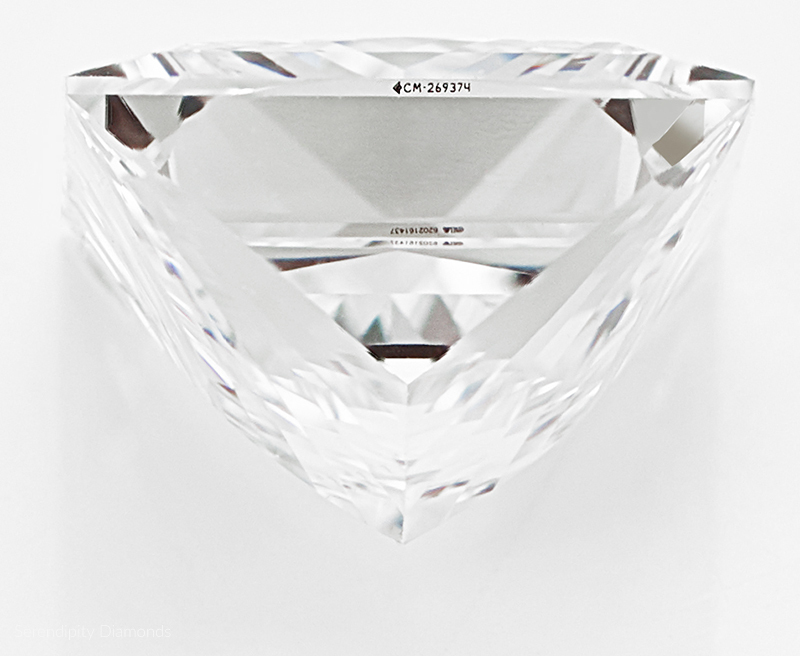 This photograph shows the laser inscribed CanadaMark number on the side of a GIA certified diamond. Traceable diamonds are 100% conflict free. CanadaMark diamonds originate from Canada’s Northwest Territories mined from the Ekati and Diavik Mines, a very long way from the troubled diamond producing areas of the World. By having an ethical origin, with full traceability adds greater value for many buyers. Imagine that you could present a diamond engagement ring to your partner, knowing exactly where the diamond came out of the ground. Many of our retail clients see a great benefit of passing along this additional value with a fully certified diamond. During the journey of a diamond from the mine to the consumer, there is a good chance that the final polished diamond will be submitted to a laboratory to be graded. The production of a reputable independent diamond grading certificate is a part of the journey but has no real bearing on traceability. Diamond cutters achieve specific market prices with the support of certification making the diamond more saleable. We favour certification from the Gemological Institute of America for our CanadaMark diamonds, which can be viewed by subscribing to our weekly updated list. Traceability is an important issue with diamonds. Traceable diamonds are certainly a great move towards giving the consumer rock solid assurances of a Conflict Free status for diamonds but this does not give any attention for developing systems for small scale artisanal diamond mining in many poorer diamond producing areas of the World. Most jewellers sell diamonds, ensuring their Conflict Free status by their regulation under the Kimberley Process, a system for addressing diamonds that were used to fund rebel armies funding their wars against legitimate governments. There is a great deal of room for addressing humanitarian issues which are often overlooked by the industry, despite many worthy initiatives that deserve support. “The Kimberley Process has helped to consolidate the peace in several African countries, but it is a regulatory system; it is not a tool for development. In the rush to congratulation, there is a danger that some of those who suffered most in the diamond wars – the diggers, and their communities – will be forgotten. For now, sourcing a traceable diamond is a great step for consumers seeking a deeper understanding of where their diamond originated. More and more buyers are demanding conflict free and more ethical credentials. With greater understanding and support, initiatives like the DDI will help to introduce systems of traceability and support for artisanal miners in much the same way that the Fairtrade System developed for ethical Gold and Silver. The next decade will certainly see many positive changes, and our aim at Serendipity Diamonds is to be deeply connected to and a part of this change. We continue our own journey—developing responsibly sourced materials for buyers who value a more ethically sourced item of jewellery without a negative impact on the people mining the materials or on the surrounding environment.